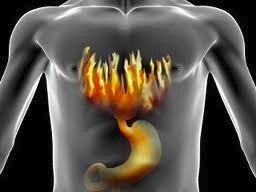 Reflux is the backward flow of stomach contents into the oesophagus. This may be accompanied by a rising, burning feeling in the chest; often referred to as heartburn. Signs and symptoms may also include an acidic taste in the mouth, increased burping, a hoarse throat or a dry cough. Reflux, or gastro-oesophageal reflux disease (GORD), is a very common disorder with 20-40% of adults reporting symptoms at least once weekly. Hiatus hernia is a common contributor to reflux. When GORD is untreated and persistent the prolonged acid exposure increases the risk of developing serious inflammation and damage to the oesophagus, with a small risk of malignancy. Diet and lifestyle modifications are often considered the first line of therapy for sufferers of reflux or GORD. Modifications such as weight loss, cessation of smoking, dietary changes and elevation of the head of the bed can be effective. Obesity can cause reflux due to increasing pressure from the abdomen onto the oesophagus. Pregnant women experience a high rate of reflux symptoms for the same reason. Diet can affect reflux in a number of ways with an individual’s dietary habits, including specific foods and drinks, playing a role. Dietary components can alter the tone of the sphincter between the oesophagus and the stomach and also affect the amount of acid that is produced in the stomach, thus exacerbating the burning sensation and inflammation of the oesophagus. Large, high fat meals are a common cause of reflux as they increase the pressure exerted on the oesophageal sphincter, slow down gastric emptying and increasing the acid produced in the stomach. Small, frequent, lower fat meals may be of benefit. Peppermint, spearmint and coffee reduce the tone of the oesophageal sphincter allowing for more backward flow of stomach contents. Caffeine containing foods and drinks also stimulate acid secretion whilst beer, wine and other fermented alcoholic beverages increase gastric acidity. Citrus fruits, tomatoes, soft drinks, and spicy foods may irritate and cause pain when the oesophagus is inflamed. Diets low in fruit and vegetables and wholegrain cereals have been implicated in increasing the risk of oesophageal cancer. Ensure you consume adequate fruit and vegetables daily, to reduce risk of reflux. Avoiding particular foods and types of meals can be extremely beneficial to sufferers of GORD. It is important that the elimination of foods does not lead to nutritional deficiencies. It is highly recommended to seek the advice of an accredited practicing dietitian (APD) who can provide individual expert advice on reflux management. Find an APD through the Dietitians Association of Australia website. Many common medications can cause reflux symptoms. If you suspect that your medication may be causing or contributing to your reflux, discuss this with your pharmacist or doctor to find an appropriate alternative or management plan. Symptomatic relief and healing of the oesophagus is generally achieved with medications prescribed by your doctor or obtained from your pharmacist. Proton pump inhibitors, H2 antagonists or for mild, infrequent cases antacids, can be extremely beneficial. Medications that are used to treat reflux or GORD can have significant effects on the absorption of certain nutrients. Antacids should ideally be taken at least two hours apart from meals as they bind to minerals such as iron and prevent absorption. Other medications used to treat reflux, specifically H2 antagonists and proton pump inhibitors, reduce the acid production in the stomach for a significant period of time. Vitamin B12 requires an acidic environment for its absorption and people may become B12 deficient due to taking these medications. The absorption of minerals such as calcium, zinc and iron, as well as folic acid and beta-carotene may also be decreased due to the change in pH in the stomach.